Nemesis includes traditional FM synthesis as well as a completely new and improved approach to FM called NeoFM synthesis. It is now easier than ever to get very good sounding results. The sound quality of Nemesis surpasses conventional synths, making it easy to locate the sonic sweet spot. Nemesis features an easy-to-use interface, which ensures that you will experience FM synthesis at its best and most entertaining. Offers a new and user-friendly approach to FM synthesis. Nemesis makes FM synthesis accessible to everyone, regardless of skill level or experience. Easy to tweak presets or program your own sounds with. NeoFM covers all important aspects of traditional FM synthesis, but is in no way limited only to bell-style sounds. It offers a very large sonic range, one that is much more varied than other FM synths. Due to its innovative technical approach, neoFM does not suffer from a metallic sound or from the weaknesses of conventional FM. No fewer than 22 combinable synthesis types. 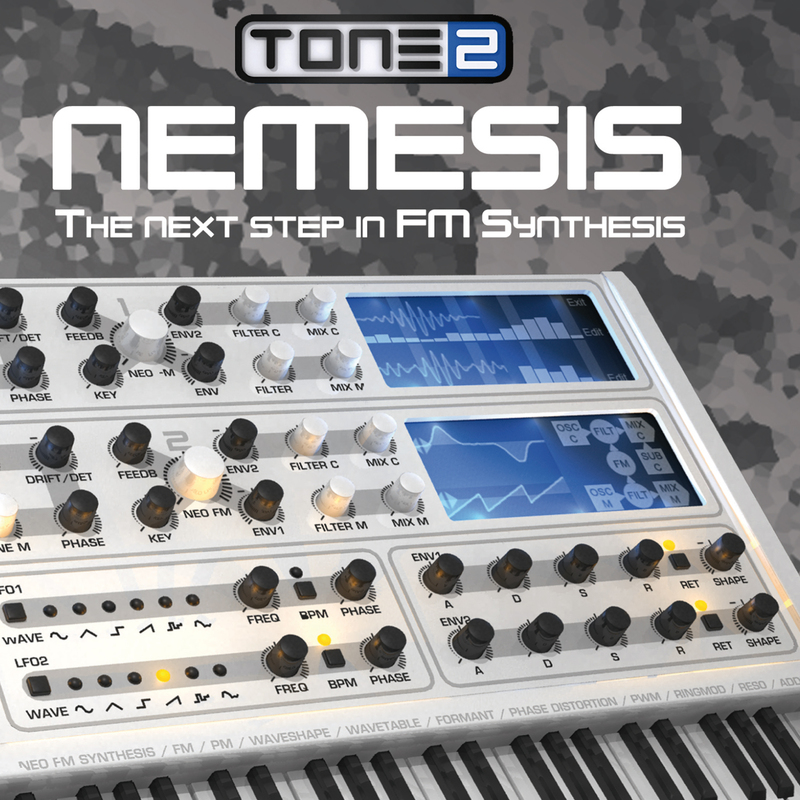 Nemesis expands FM with further synthesis methods such as Additive, Formant, Wavetables, Waveshaping, Phase distortion, Sync and Reso synthesis. Contains 1000 inspiring patches from professional designers. 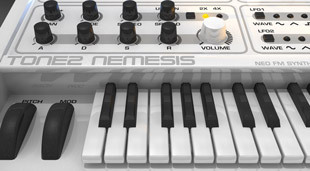 Nemesis features a large number of exclusive sounds that are not possible with other synthesizers. Perfect for modern, as well as all other music styles. Wave import, resynthesis and the additive spectral editor offer unlimited sonic possibilities. An extensive number of high-end quality effects, with flexible and innovative routing options. Trancegate with an extensive selection of setup options. High-End sound quality with low demands on your CPU. Nemesis features pristine tonal quality and offers sonic possibilities far beyond the scope of conventional FM synthesizers. 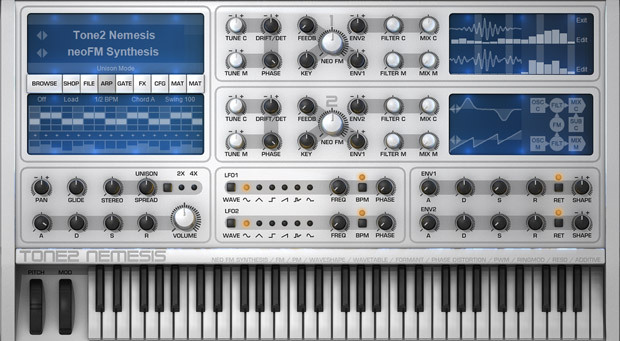 A uniquely silky signature sound is generated by Nemesis synth engine, which is capable of providing warm, smooth, and creamy tones as well as the classic ´cold´ sounds FM synthesis is well known for. Whether you desire a crisp, clean sound or downright nasty tones, the NeoFM engine delivers with the highest sound quality possible! Since it is impossible to describe a sound with words, and because a demo-song cannot show the dynamic expression and huge sonic range that Nemesis provides, we recommend that you download the free demo to hear Nemesis unique sonic capabilities for yourself! 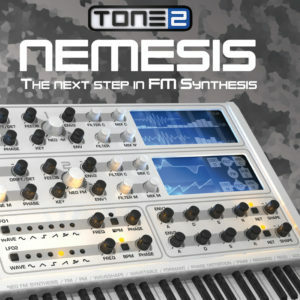 Nemesis offers an innovative approach called ´neoFM´ synthesis which is genuine FM synthesis. Most conventional FM synths such as the DX7, use phase modulation (PM) instead of genuine FM synthesis, yet such synths are branded as FM synthesizers for marketing reasons. However, the traditional PM approach is limited to using dark sounding waveforms like sinoids or triangles, which results in a dull or bell-like sound. Classic waveforms like a sawtooth do not work well with it because they result in an unpleasant, sharp and excessively metallic sound. ´Real analog FM´ suffers from drift and lacks precision, resulting in a disharmonic sound, which is musically not very useful. The innovative neoFM approach, exclusive to Nemesis, combines only the advantages of both types of synthesis without suffering from any of the weaknesses associated with PM or ´Real analog FM´ synthesis. As important as anything else within a synth are the effects. We spent a great deal of time ensuring that Nemesis featured a suite of high quality FX. No less then 33 effects are available from the effects section, ranging from Reverb, Delay, Chorus, and Phaser, to Tremelo, Vibrato, Distortion, Amp-Simulation, Bitcrush, Degrader and Compressor. To complete these effects, several flexible routing options are included. The innovative Ducking Mode makes your mix sound more transparent and fat. Nemesis offers smart micro-tuning, exclusive to Nemesis, which makes chords sound both fatter and more transparent at the same time. It also offers optional punch and psychoacoustic features to add a little kick to your sound. Almost a synth by itself, the arpeggiator section holds the key to all of your arpeggio needs. It offers a way to set up your own arpeggios that is both powerful and easy to work with. We developed smart algorithms which return melodies that are more useful musically than conventional arpeggiators. Working with the arpeggiator is extremely simple. Just lay down your notes inside the note sequencer as you normally would and select the play direction. The arpeggiator also supports optional advanced features such as auto-chords, polyphonic playback, pitch slides, legato, swing-shuffle, split, matrix integration and it gives you very precise control over note-sorting, play direction and velocity. Dont feel like programming your own patterns? Use one of the built-in patterns or load one of the many external pattern presets to use as a starting point. Working with an arpeggiator should be fun and inspiring. The arpeggiator in Nemesis is as fun and inspiring as it is powerful, flexible, and easy to use. Nemesis also offers a dedicated Gate section. As with the arpeggiator, we aimed to make this as intuitive and flexible as possible. The Gate section provides advanced features like Contour, Fading, Swing and Shuffle to fine-tune your gate to perfection. Arpeggiator, gate and modulation run in perfect sync with each other. This allows you to use the three together in all kinds of creative ways and it makes them easy to use and fun to play with. Modulation is where the true power of a synthesizer emerges. By using the modulation matrix, Nemesis allows you to connect dozens of modulation sources to all-important sound parameters. Want to use an LFO to wobble your filter? Simply set the proper assignments inside of the modulation matrix and you´re on your way. Modulate almost any parameter well up into the audio-rate speed, from internal modulation sources like the LFOs, to a wide variety of MIDI messages. We´ve also included midi-learn, so assigning CC´s is as simple as a right-click and a knob-turn. Modulation can be as simple or complex as you want it to be. Nemesis modulation system is there to provide whichever modulation routing you require to create your perfect sound. CPU load is always an important factor to consider, especially in light of today´s complicated multi-track projects. We made sure that Nemesis is as easy on your CPU as possible. Nemesis offers a rich, deep sound, the very best sound quality, and low CPU usage. What is the advantage of good sound quality if it consistently brings your system to a halt with a mere single instance of the synth?